Yes, it’s been a bit since we’ve written a post. No, more rain is not the unfortunate things to which I am referring, though when one wants to be out and about exploring, too much rain is unfortunate. After leaving Wet Texas and spending a sunny week in Comfort, Texas, Jim and I decided that as much as we had hoped to visit other states west before it got too warm, we needed to head east since his next contract is in the Northeast. Though our camper won’t go to northern Massachusetts for a year plus project, it makes more sense to be where his flights will be cheaper and more friendly to him being home as much as possible on weekends. With this in mind, we turned back east and made it to Breaux Bridge, Louisiana, on the 10th of March for our next week’s stay. Rain found us there also, and we set up in the pouring rain. One thing that was unfortunate is that on our way from Comfort, TX to Breaux Bridge, LA, we had pushed ourselves a little too hard. By the time we stopped at a truck stop near Beaumont, TX to get fuel and sleep, we were so tired that, even though we discussed it, both of us failed to turn on the propane while stopped to keep our refrigerator cold. Upon arrival at Cajun Palms RV Resort, we had to empty most of the things from our refrigerator into the trash and then go shopping to replace those items. The moral of the story is that when you push yourself too hard, mistakes happen. This was the first time for this particular mistake; hopefully, it will be the last. Then, truly unfortunate things began to happen. First, Jim received a call from his mother late afternoon on March 13th. His 50-year-old sister had died unexpectedly. Keeping in touch with family by phone, he worked while waiting to know the family’s arrangements. Not yet knowing for sure what the arrangements would be, he and I decided to change our route, leave Louisiana on Friday, a day early, and drive as far east and then north as we could by Saturday. Two things happened as he and I prepared to leave. I got the first of many phone calls that day pertaining to my mother; it let me know that she had taken a bad turn and would be going to the ER that day. 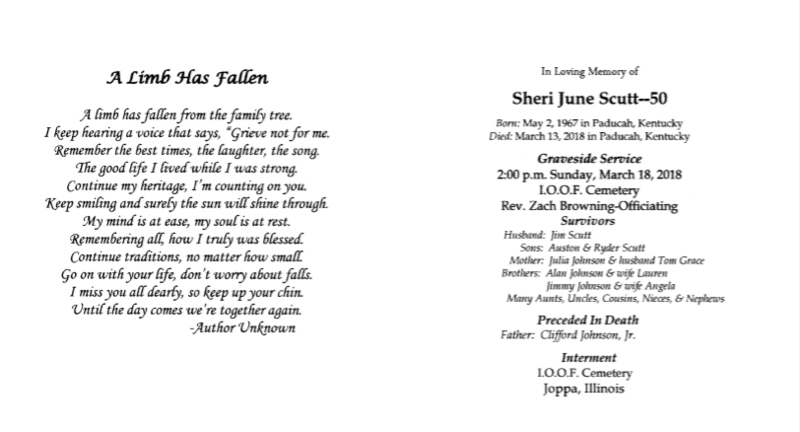 Jim also got a call from his mother letting us know that the service for Sheri, his sister, would be Sunday afternoon in Joppa, Illinois. We had our hands full. Add to that, we were once again racing incoming rain. As we drove, I continued to be in touch with folks in Tennessee, and before we were off the road that Friday, my mother had been admitted to the hospital for observation and medication adjustment. Jim and I pushed through until reaching Hattiesburg, MS. The rain had not only found us but was constant. As he and I looked for a place to stop for supper, the Spring Break traffic was heavy, as it had been all day, and we saw wreck after wreck along the Interstate. Having counted four wrecks in less than ten miles, once he and I were off the road to get something to eat, we decided to call it a night and not too push too hard again. We found a nearby Wal-Mart very welcoming. He and I slept well, woke early, got breakfast at a nearby Waffle House, and was on the road before 4:30 a.m. The rain had passed through, and we were traveling too early for traffic to be heavy. With an early start, we cancelled our reservations near Tuscaloosa, AL after confirming we could get a spot for a week a bit farther north in Cullman, AL. Arriving midday on Saturday, this put us about a 5-hour drive by car from Joppa, IL. Sunday morning, we left for Illinois. Our youngest son and his family, who would be just a few miles off the Interstate on our way, volunteered to watch Chewie for us, so our first stop was Clarksville, TN. Jim and I made it to his Mom’s house shortly after 11 a.m., so we visited with family there until time to leave for the grave-side service at 2:00. Food was waiting for the family after the service at the Joppa Community Center. We continued remembering Sheri there as we ate and visited with family. In the evening, we checked into our hotel, took a short nap, and then went to our youngest daughter’s house for a couple of hours before calling it a night. Early Monday morning, we retraced our route south, picking up Chewie and getting back to the camper in time for Jim to grab his suitcase, put it in the truck, have a bit of lunch, and then headed to Birmingham, once again racing storms, for his flight to the Chicago area for work. I decided to take my own suitcase and Chewie and head to my Dad’s home to visit and spend the night since it was on the way to the hospital I’d be visiting the next day to see Mom. As I write this, Jim and I have moved to Athens, AL – about 45 miles from my Mom’s house. He has been frantically working to wrap up the Illinois project before he must start the Massachusetts project mid April. Almost all of my time the last 10 days has revolved around taking care of my Mom’s house, her needs, and doing the bare minimum to keep our own home going. At the moment, it is not looking good for Mom to be able to come back to her home to stay, but we’ve not given up completely. The next several weeks will continue to be fluid as we adjust to Mom’s needs and Jim switches from one work contract to the next. I can’t fault Jim for accepting a wonderful year-long project on which he will be able to work with some of his favorite consultant colleagues, though I am going to miss him during the week. It is also a wonderful opportunity for him in staying on the cutting edge of his business. Things always seem to happen for a reason. 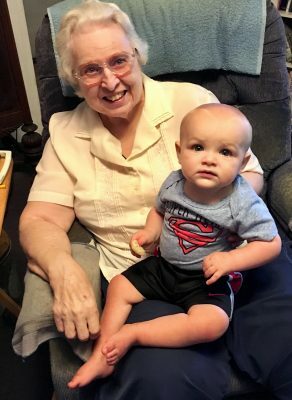 We now see that Mom’s needs have increased faster and more dramatically than we could have predicted, and I am going to need to be closer to her over the next bit whether she is able to come home to stay or not. Just because we get to live a wonderful, nomadic life while Jim also works on the road, it doesn’t mean that unexpected things don’t happen during our journey. Some are unfortunate things; some are fortunate, but most end up being a mixture of the two. I think learning to live the flexible, RV-travel lifestyle helps us more easily adapt to the unexpected. Because we are not anchored to a sticks and bricks home in one location, we have the ability to go where we need to be (for the most part) when life happens and changes have to be made.